This would save us having to copy over the entire array to a different fsm, just to do an Array Contains search on it. EDIT: this is even harder than I thought. It seems we can only use Array Contains by index or exact type match (game object array contains this game object?) rather than saying "game object array contains game object named X?" We need to be able to check ANY array type for an entry with a certain NAME, whether it's an array of prefabs, textures, strings, etc. Please help. I am confused, can you give a concrete example with proper variable names, types and fsm, the I'll be able to understand more. Typically though if you want FsmArray to be a central part of your game data, you are better off using ArrayMaker which by design is decentralized ( it's its own component), and they offer a lot more flexibility both with array with multiple types and more advanced features to work with the data, as well as hashtables. Thanks, I have most of those ecosystem actions, but I don't see any that can do this. I just need to get an array's item by a string of the name of its contents, rather than by its ID. I need to check an array to see if any of its entries is called X string (even if it's NOT a string array), then get THAT index entry, whether it's a game object, a texture, etc. I'll look into ArrayMaker as well, but for now this is the only thing I need. I'm trying ArrayMaker, and it also seems to not be able to do this. Here's what I'm trying to do. I find the name of the item that the player is holding. So that's now in a STRING variable. Then I want to update the Equipped Item Icon display in the HUD. So I need to find, from my ItemIconTextures arraylist, the texture that has the same name as the item the player is holding, WHEREVER it's stored in the array, regardless of its index. i'm adding new textures and prefabs all the time, so indices don't help since all I have is the name of the object being held, to use. UPDATE: I can't get it to work. It never finds anything. 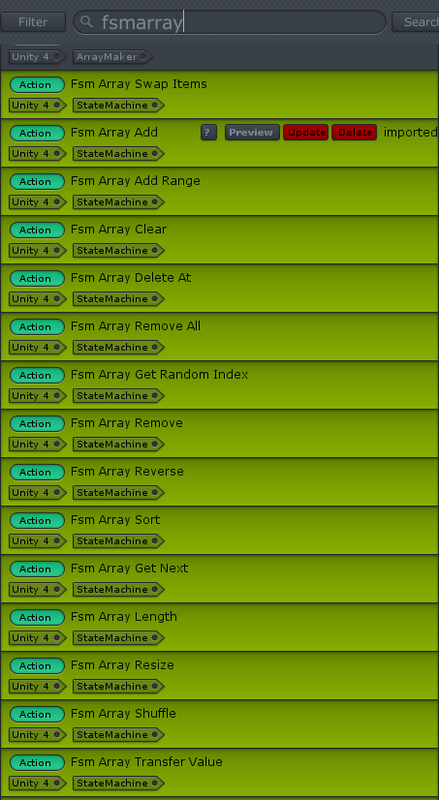 In the Array List Contains Game Object one, it won't find UNLESS I specify a tag. It works, but it'd be great if it didn't need a tag (Untagged was used in this case) and could find regardless of any tag, since this Array will eventually contain objects with different tags. In the Array List Contains Name action, I can't make it find anything at all in the referenced Texture Array List. What am I doing wrong here? I tried editing the Array List Contains Game Object to make it a Array List Contains Texture action, but it kept telling me that either a path returned nothing (when I commented out the tag parts) or that it didn't expect a return. i don't get it, but I attached it. It'd be great to have these actions for ALL variable types, not just Game Object. That's what the action Array List Contains Name seems to be, but I can't get it to find anything, as shown in the images. ok, I see, you want to search for a property of the item. That's really going to backfire at some point, I would definitly avoid doing that. then when you want to get content for a given player you use the key to get it. you would have several hashtable, one for texture, one for indexes, one for score, etc etc. you could even use the new ArrayTable and organize data this way. okay, can you explain why it would backfire, though? waveform, that could be a helpful action. I need to be able to search within another game object's fsm's arrays, though this action seems to only do it locally within one. The array lists are cool, so the ideal action may instead be a modified version of the current Array List Contains Game Object that allows you to select the type of variable you are looking for (texture, game object, etc.) Would it be possible to modify that action to allow this? In a previous comment here I attached my attempt to modify the action for textures, but it kept giving errors I don't understand. u can simply checkout my action as example then modify array list action to fit what u need, u can also make a template and run it with Run Fsm action. but in this case i really recommend use hashtable,it save a lot of perfomance.